With the proliferation of drones in the world and the rapidly increasing improvements in said technology, the landscape of modern war has changed to where battles can be fought from the comfort of a bunker thousands of miles away from where the combat is occurring. Gavin Hood's Eye in the Sky explores this new combat frontier and all the ethical dilemmas it presents through a fictional joint-operation raid of a terrorist cell in Kenya. The result is an intensely gripping procedural that produces outstanding performances from a solid, well respected cast including a final turn from the great Alan Rickman. The plot of this film focuses on a British investigation into terrorist activity in East Africa. Led by Colonel Katherine Powell (Dame Helen Mirren) and with coordination and buy-in from a variety of US/British commanders including the US Secretary of State, British Prime Minister and various other key decision makers, a mission to eliminate is put in motion. 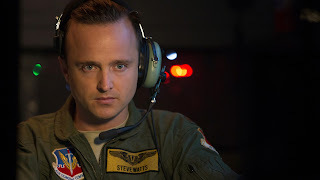 Supporting the effort from the United States in a Las Vegas operations center are a team of drone pilots led by Breaking Bad's Aaron Paul (as Steve Watts) who provide air-based surveillance remotely across the globe from a small protected bunker. We see Paul and his Air Force co-pilot relieving two other pilots after a long shift. Instead of getting in a jet and flying through continents to complete their mission, they simply strap into a seat with a control stick and a variety of monitors. It's almost like playing PS4 from the comfort of your own couch although lots of real lives are at stake. The stakes of the mission increase once the terrorists are located and are seen arming themselves. It is then when the key decision of the film has to be made. The rules of engagement to attack with a remote missile are weighted against the collateral damage estimates. In a series of back and forths between numerous high-ranking military officials in London and other countries across the globe, a facial detection team in Hawaii and the pilot strike force in Las Vegas, pros and cons of a strike authorization are laid on the table. The ensuing arguments, negotiations and discussions by all parties involved are riveting to watch and essentially serve as the meat of this story. The technology employed is amazing itself and I find it hard to believe that such image clarity and real-time monitoring capabilities can come from a remote operation. While the story was thoroughly interesting to me, the real effectiveness of this film lies in the acting. Mirren is daring and authoritative in the lead role. Her calm and driven demeanor helps drive the credibility of her character. Paul is really good as Watts, a green pilot who must weigh his mission goals against his own ethical makeup. He is able to emote so much in a role in which he's just sitting in a chair most of the time. There really is a bright future in Hollywood for Jessie Pinkman after all. It's bittersweet to see Rickman in this movie knowing that he passed away not too long ago. While he has two upcoming movies in which he provides voice-over work, this is indeed his final acting performance. He brings a small bit of much needed to humor to this movie and he will be missed for sure in this industry. Bonus kudos to Captain Phillips' Barkhad Abdi who gives a good performance as an on-the-ground operative in charge of flying a small bug-sized mini-drone that serves as a crucial plot point. Hood does nothing revolutionary here (despite acting in the film as well) and the pacing is a bit slow at the start, but he does build tension effectively. I was glued to my seat for the final half of the film and the 102 minute run-time flies by once the pieces are set in motion. I fully recommend seeing this film in the theater (in limited release right now). It will make you think about ethical decisions made in war and does a wonderful job of balancing both sides of a key argument towards the end of the movie. This film is superbly acted and thought provoking and sits near the top of the best movies I've seen thus far in 2016. A strong 4.5 out of 5 JRs for a film that gives the general public a unique ringside seat to witness the intricacies of modern warfare.